Hi Guys, so how's your day today? I do hope that all good and lovely! Yesterday, i slept at 3 AM because the loading process of @amygostore bazaar at a mall just finished at 2 AM. Phew! It's really been a hectic week, but i'm happy because it means: being productive! 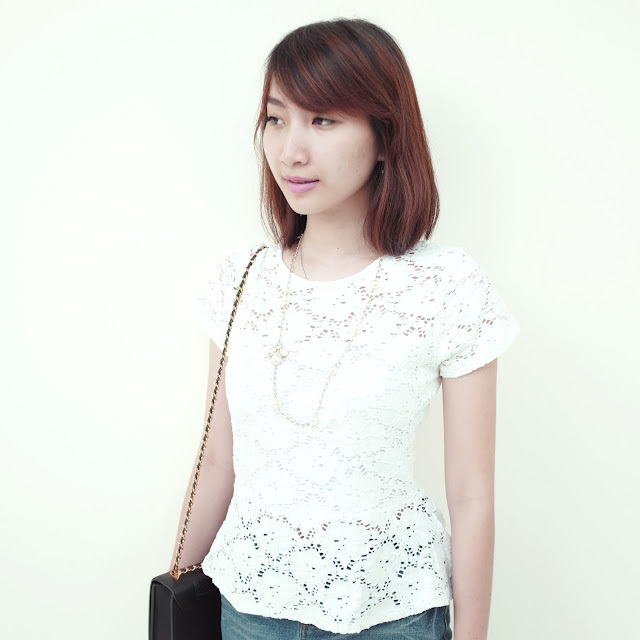 In this post, i wear something delicate, sweet and pretty item: brocade peplum top. It's actually a new arrival on www.amygostore.com soon, but i really can't wait to wear it ;D It's reaaallllyyyy pretty! The fabric is very stretchy, so it will shape your body figure nicely. Some of you may haven't know the trict to wear clothes when you are not confident with your belly. 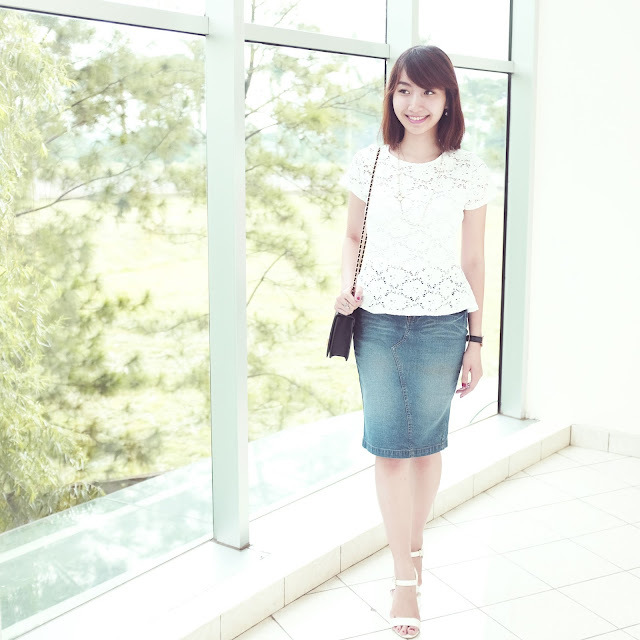 Just wear peplum top/ skirt and TADA, it will give you illusion a flat- tummy. That means: bye bloated belly- awful look!! My makeup today. put on some lashes and peachy pink matte lipstick. Foundation and peach blush are must! Just paired it with a denim pencil skirt and added monochrome block heels and a purse. That day, i just wanted to dress in a classic and simple way, so i opted white and jeans. 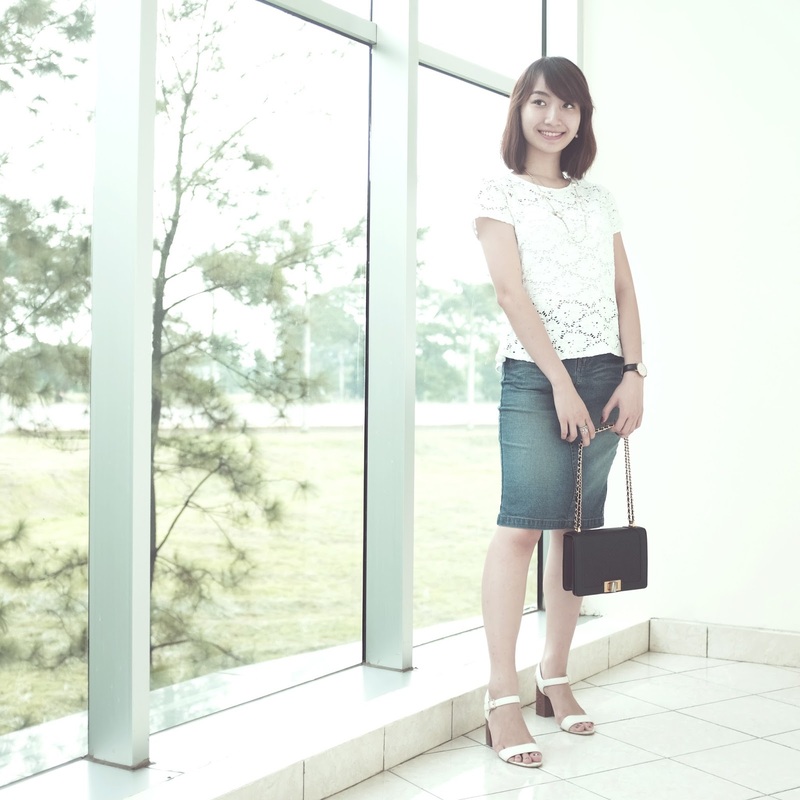 To give some elegant touch, i decided to put on pearl necklace, in a more casual way. I've been juggling between my study and business, and another job! Of course, college is my priority. I always finish my tasks first then i will do my other job. Some of people ask me, how can i manage all things to do in the same time? I would probably answer: make priority and lists to do. Second step, you gotta be discipline and follow your own tight schedule (made by6 yourself). You can't give up by taking a nap 2 hours when you already planned to have meeting at 14.00 o'clock, you'll running late! The third step, don't forget to enjoy all the process and have some fun too!